The organisation that sets standards and regulations for the sport of rugby is the International Rugby Board or IRB. The headquarters is located in Dublin, Ireland. The IRB allows rugby players to use pads that are less than 1 centimetre thick when not compressed, and have a density that is less than 45 kilograms per cubic meter. 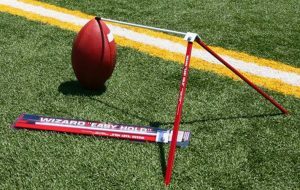 The introduction of the kicking tees over the last few years has made the life of goal kickers in the sport much easier. A kicking tee is a small piece of plastic that goes on the ground under the ball to hold it in an upright position. You can think of rugby kicking tees as a device that is similar to a golf tee that holds a golf ball when the golfer prepares to hit it. The method used to kick a ball before kicking tees existed was to use a hand-sculpted mound of dirt or sand. Players would first wait for a boy with a sand bucket and then wait until the goal kicker builds a hill out of the sand and be satisfied with the results of his work. Obviously, this process was taking much more time than just placing a kicking tee on the ground. Different kickers have different thoughts on placing the ball on the tee and use different strategies and angles. The tee caters to most of these preferences. Not every player on the team has to have a kicking tee, but if you are considering kicking, a tee is a must-try item. You will not be able to use your own personal tee during a team game because clubs have their own tees, but for practice, you will need one. Your club may give you the spares if they have one. The club may also be selling all kinds of rugby gear, from bags and hats to jackets and warm-up clothing. romseyrfc.co.uk © 2019. All Rights Reserved.